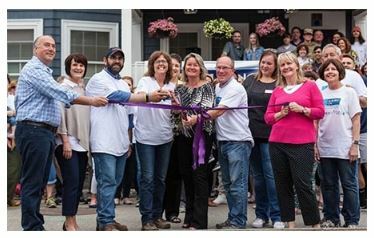 Building on Hope, an organization of New Hampshire volunteers including designers, architects, suppliers and builders who renovate a Granite State nonprofit group’s facilities, recently completed the $500,000 community-funded renovation of the Crisis Center of Central New Hampshire in Concord. More than 400 volunteers and 280 businesses came together over a period of more than 10 days to transform the house that serves as an emergency shelter. The transformation of the facility, the only agency exclusively dedicated to working with survivors of domestic and sexual violence in Merrimack County, was Building on Hope’s fifth project, and drew the largest number of supporters the all-volunteer group has rallied in the past nine years. CCCNH’s building is nearly 120 years old. It had outdated systems and an inefficient floor plan suited for a family of four instead of an emergency shelter that regularly houses 13 women and children with office space for all of CCCNH’s staff members. The renovation has nearly doubled the shelter’s capacity from four bedrooms with 13 beds to seven bedrooms with 23 beds. A total of 17 rooms were renovated and the house was equipped with a new security monitoring system, mechanical system with heat and air conditioning, windows, exterior siding, interior flooring and is now wheelchair-accessible with a lift on the porch and an ADA-compliant kitchen, bathroom and bedroom. With the exception of one small office dedicated to an on-site staff member, all space in the house is designated for survivor use. CCCNH staff offices have been moved to a new building that will eventually become The Center for Survivor Support. On May 20, more than 100 volunteers, community members, local elected officials, CCCNH staff and board members participated in a ribbon-cutting ceremony to reopen the emergency shelter.